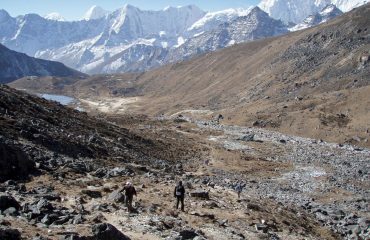 This Everest Circuit Trek is perhaps the ultimate high-altitude trek, in the world’s most spectacular mountain terrain. Think of this not just as a trek but more as one of the finest mountain journeys you are ever likely to undertake in your lifetime. It’s undoubtedly tough – but the scenery provides more than ample rewards. 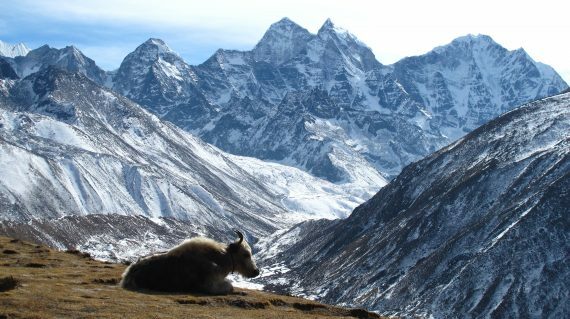 All about the Everest Circuit Trek [Three Passes]. The Everest Region Trek is a challenging trekking route in the Everest region with the most scenically stunning areas. 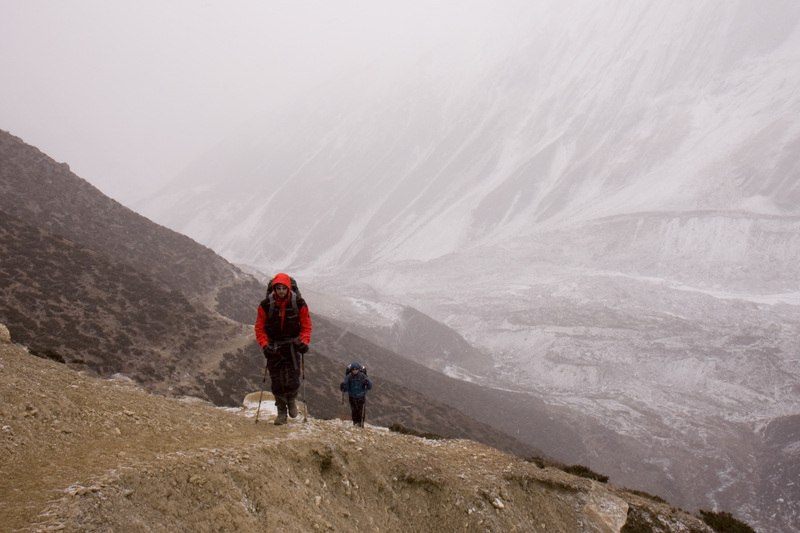 You trek through the three major Everest valleys, by crossing three high passes. 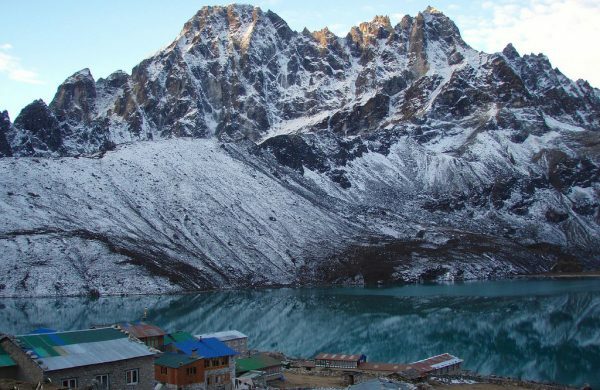 Also you trek to Everest Base Camp and to the holy Gokyo Lake. The three high passes along this route are Kongma La pass (5535m), Cho La pass (5330m) and Renjo La pass (5445m). 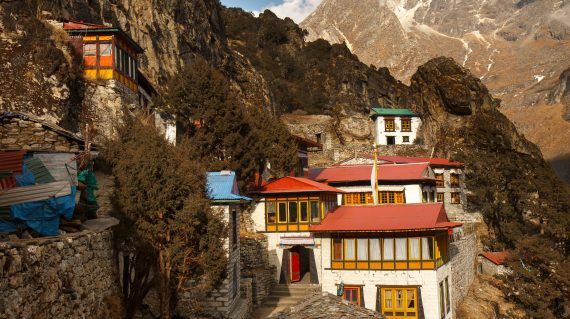 These passes make it an ultimate high-altitude trek in the world’s most spectacular mountain terrain. It’s undoubtedly tough, but the scenery provides more than ample rewards. 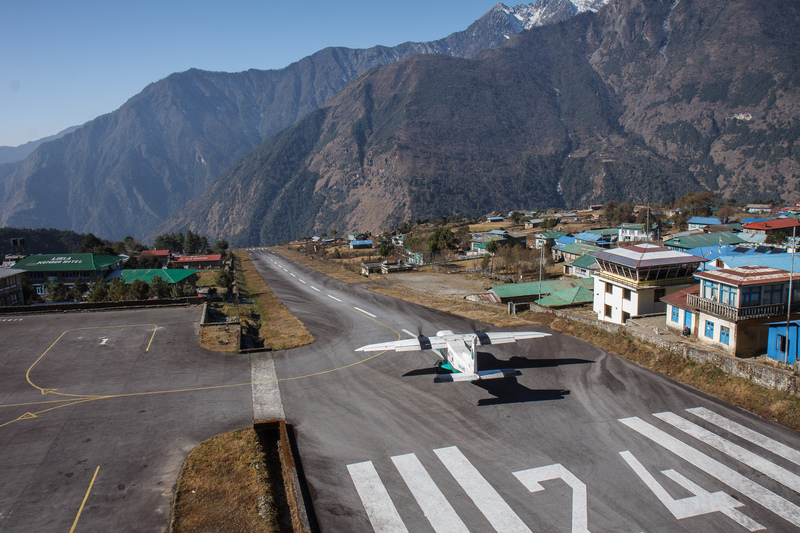 From Kathmandu you fly to Lukla from where you follow the classic Everest trail. 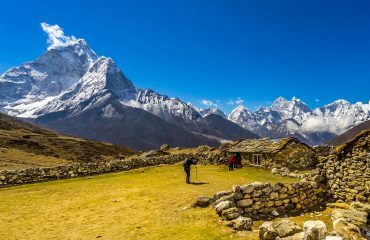 You trek via Namche Bazaar, Tengboche and Dingboche to Kongma La pass that’s surrounded by dramatic views of Ama Dablam, Makalu and Lhotse. 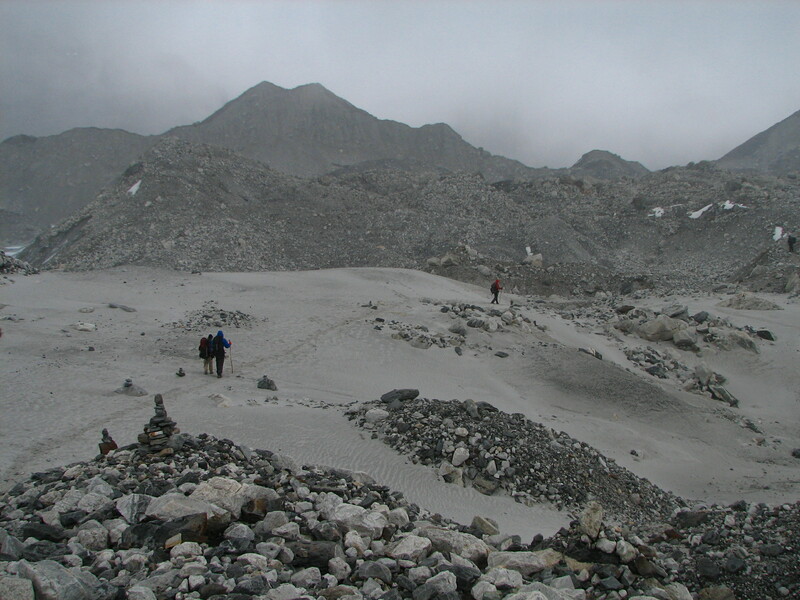 From the Kongma La pass, we descend to the Khumbu glacier. We traverse the glaciated Cho La pass to Gokyo where we explore the valley and climb Gokyo Ri to enjoy more excellent mountain views including another angle of Mount Everest and Cho Oyu on the Tibetan border to the north. Then we scramble across Renjo La, dramatically back-dropped by the Everest range and enter the Bhote Khosi valley. There we will walk along grazing pastures and a trading route used by yak trains from Tibet to Thame. It is a short day from Thame to Namche Bazaar from where we re-trace our earlier steps to Lukla and fly back to Kathmandu. 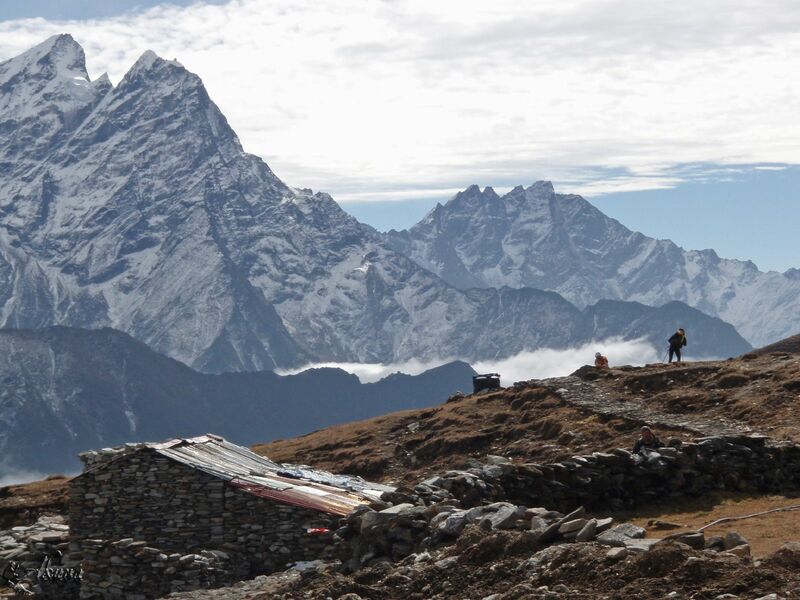 You can also choose to go for the original Everest Base Camp Trek. Then you skip the flight to Lukla and follow the footsteps of the legendary mountaineers Edmund Hillary and Tenzing Norgay Sherpa. 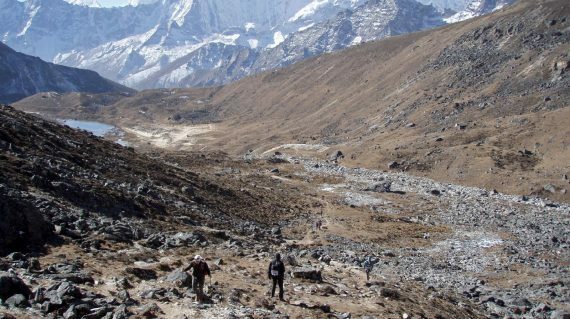 Go for more info about this route to the 22-days Classic Everest Base Camp trek from Jiri. 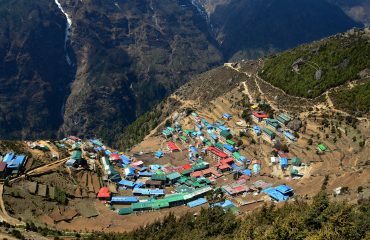 If you have less time for trekking, you might prefer the 12-days Everest Base Camp Trek from Lukla. Or if it would be the first time to cross a high pass, you might prefer starting with just one. 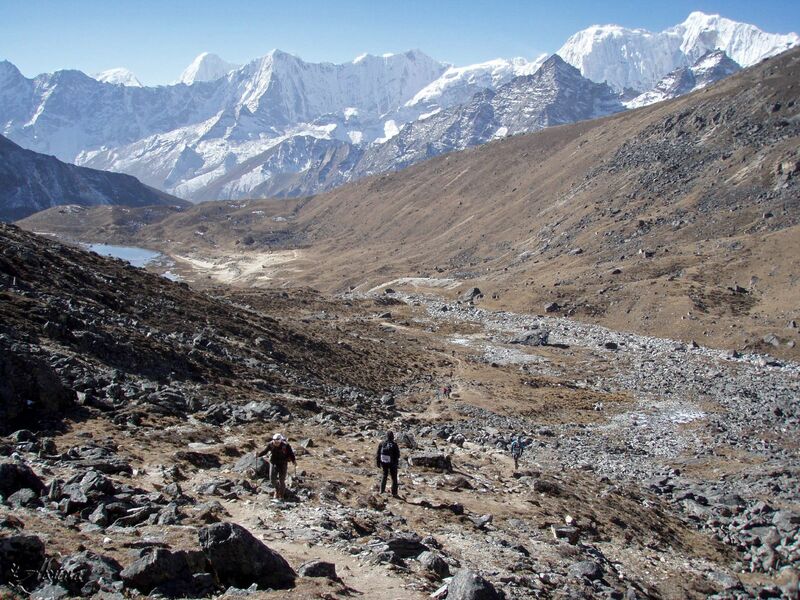 Go for more info to the 16-days Everest Base Camp Trek via Gokyo Lake & Cho La. Today, after a good night of sleep after your flight, we will meet at your hotel or at our office for a pre-trip meeting. We introduce you to your guide and talk about your itinerary. If you have any questions or requests, we would like to hear them from you. Furthermore, you can use this day to adjust to the different timezone, altitude and climate. Also, you can prepare yourself for your trek and do the last shopping at one of the many outdoor gear shops around your hotel. 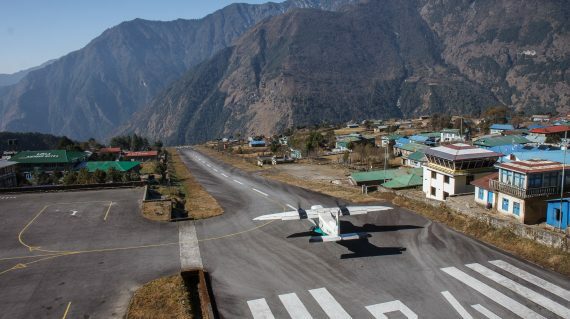 Early morning your guide takes you to Tribhuwan International Airport for the short but scenic flight to Tenzing and Hillary Airport at Lukla (2800m). Once we are in Lukla you can explore the village while your sherpa crew sorts and loads the trekking equipment. When everyone’s ready, we begin our trek! First we descend towards the Dudh Khosi river where we join the main trail to Namche Bazaar, just above Chaunrikharka (2713m). The walk is easy. After we pass the small village of Ghat (2550m) there is only a short walk left to Phakding (2610m). After breakfast we continue our trek along the banks of the Dudh Khosi river. 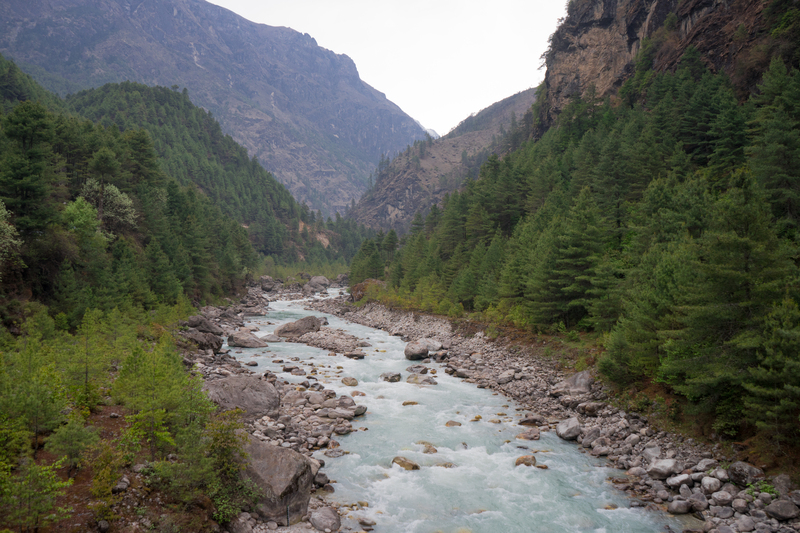 We cross this majestic river many times via exciting suspension bridges full with prayer flags. After we enter Sagamartha National Park, the trail climbs steeply. And if the weather is clear, we have breathtaking views from here. 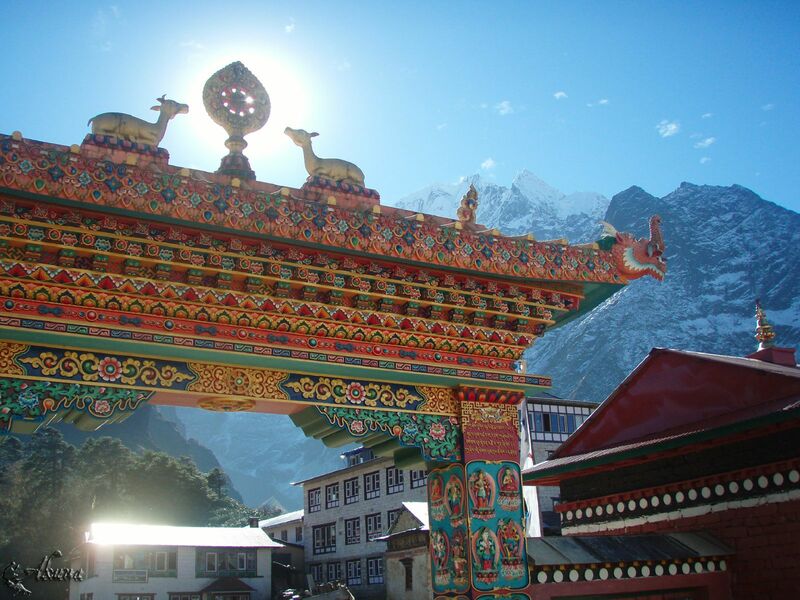 Namche Bazaar (3441m) is known as the Gateway to Everest and is home to many restaurants, hotels, lodges, shops, bakeries and even money exchanges and internet cafes. 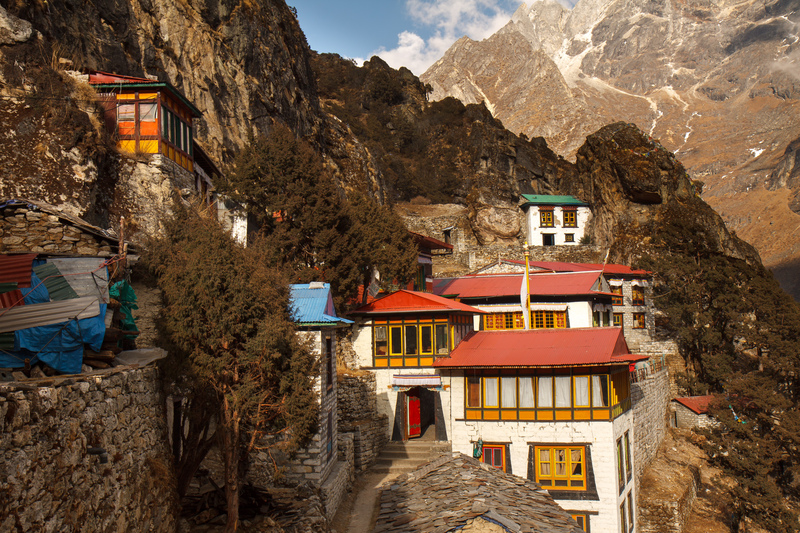 Namche is one of the biggest villages along the entire Everest trail. Today we spend the day here in Namche Bazaar to acclimatize and adjust to the thinner air. 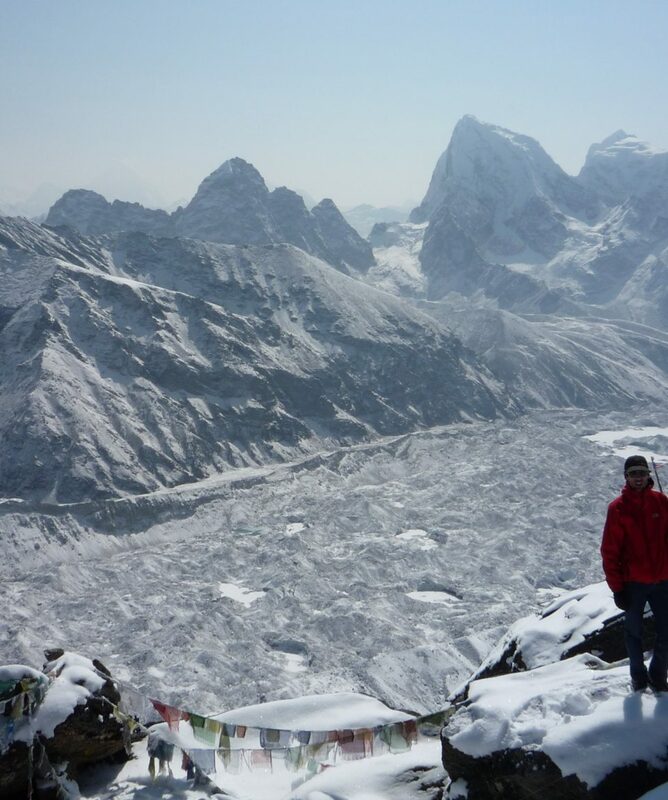 If the weather is clear, it’s a great opportunity to hike up to Syangboche for rewarding views of the Khumbu peaks. Now our trek continues along the rushing glacial waters of the Dudh Khosi river with magnificent views of the mountains. Today we trek to an altitude of 3860 meters. 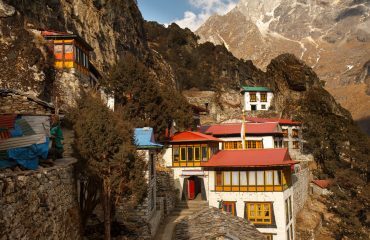 By reaching Tengboche we see local Buddhist monastery. Inside we can see incredibly ornate wall hangings, a 20-foot sculpture of Buddha and the musical instruments and robes of Lamas. Here we can observe a prayer ceremony either in the evening or morning, depending on how our trek went today. From Tengboche the trail drops to Debuche and crosses another exciting suspension bridge on the Imja Khola. 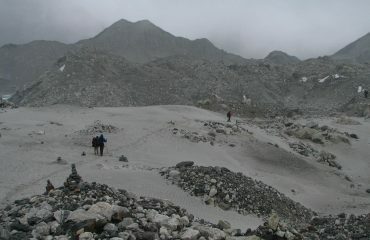 Then we climb to Pangboche along thousands of mani stones. 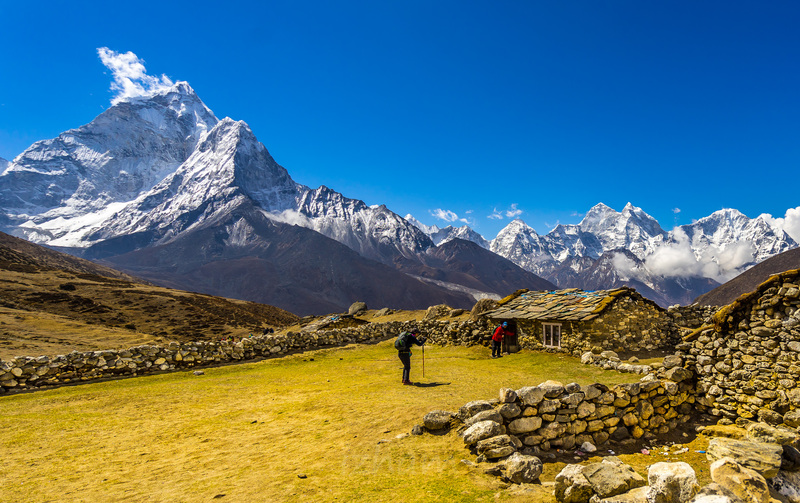 Today our uphill trek takes us to the quaint traditional Sherpa village of Dingboche (4350m) with its exquisite views of Lhotse, Island Peak and Ama Dablam. We take our time to prevent getting affected by the altitude. Since this is a challenging trek, we need regularly free days so that we keep our energy. Today we explore the nearby ridge and enjoy striking views of soaring Makalu, Lhotse and the Cho Oyu mountains. 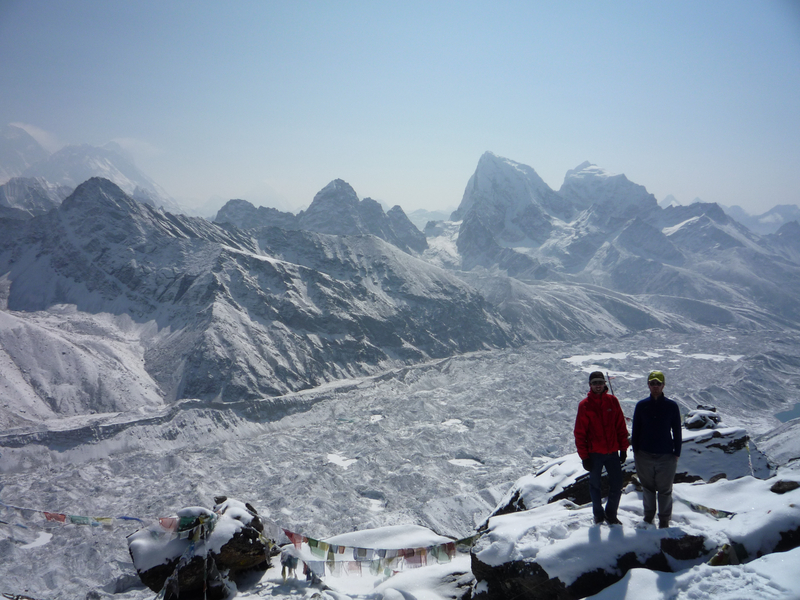 The ridge also offers us views over the Imja valley and Lobuche’s and Cholatse’s peaks. The trek today begins through crop fields. 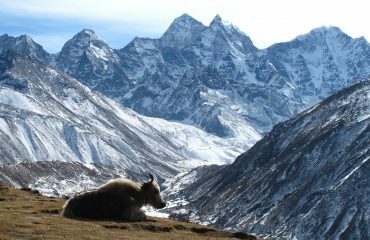 We climb to the valley of Imja Khola which offers us views of the mountains of Lhotse and Ama Dablam. Then our trail continues through Bibre, a scattered settlement of yak herders. When we walk further, we reach the village of Chhukung that offers us a striking view of Imja Tse that is also known as Island Peak. Crossing Bibre, we climb all the way to the Niyang Khola valley. To reach Kongma La pass, we head east and cross the gorge with frozen lakes. From the pass we can enjoy the views of mountains in Nepal and Tibet. After a short break we head down to the Khumbu glacier and trek to Lobuche and finally, to Gorak Shep. Today we explore the lake of Gorak Shep with freezing cold water. When we trek past the Indian Army Mountaineers’ Memorials, we reach Everest Base Camp. We hope for a bright, clear day as this place offers striking views of Nuptse, Khumbutse and the Pumori mountains. 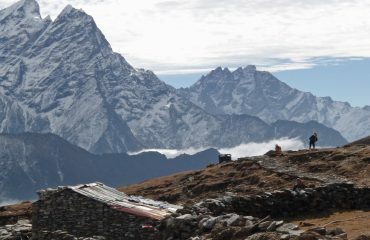 But we won’t spend the night here in Everest Base Camp, instead we go back down to Gorak Shep. From Gorak Shep we return to Lobuche and trek down further until we will reach the river bank. 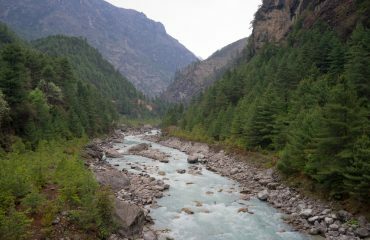 Then we cross the river and take the ascending trail to the top of the ridge for striking views of Ama Dablam and the Thamserku mountains. And we trek further to Cholatse lake. From here our trail goes through few ups and downs to reach the bridge to reach Dzonglha. When we trek to the hilltop of Dzonglha we have a striking view of the Cholatse mountains. Then we head west before descending to the gorge. 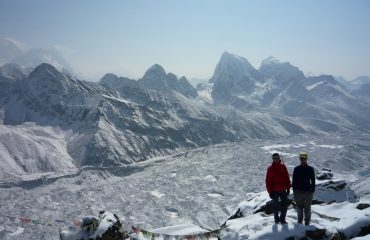 We climb the gorge and reach the vantage point which offers views of Ama Dablam and again the Cholatse mountains. We climb Cho La pass which offers panoramic views of several mountains and peaks in Nepal. Finally, at the end of our route today we there’s only left the rocky path to Tagnag. Today we continue following the rocky path with striking views of mountains and valleys. We also pass the Ngozumpa glacier today, which is the longest glacier in Nepal. We cross the glacier and to reach the third Gokyo lake which is located on the verge of Gokyo village (4750m). If our trek goes as planned, we have a spare day now. We can either spend it with a visit to the fourth and fifth lake of Gokyo. In total there are six lakes in the Gokyo valley. Or we climb the Gokyo Ri peak (5360m). From the Gokyo valley we now head west and trek to the foot of Renjo La pass. Renjo La is the high pass of this trek, with an altitude of 5320 meter. From the pass we can enjoy the gratifying views of mountains and peaks of both Nepal and Tibet. For instance we can see Kyajo Ri from the western section of Renjo La. Then we continue our trek to reach Lungden where we spend the night. A walk along the rocky path leads us to the river. When we reach the Sherpa village of Thame, we explore the village to get to know the local culture, the traditions and way of living. Also we visit Thame’s Buddhist monastery today. 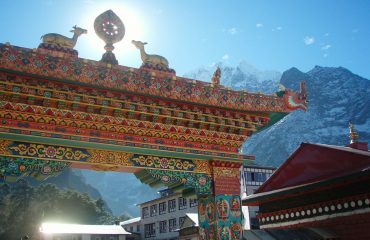 From Thame we return to Namche Bazaar, cross Dudh Khosi river and move through Sagarmatha National Park to Manjo village. The entrance of the Sagarmatha National Park is at Manjo. Finally, today we return to Lukla where our trek began. It seems like a lifetime ago. Together we enjoy our evening and reflect on the trek as a group and the personal achievement of all those who took part. When we fly back to Kathmandu, we enjoy our last glimpse of the mountains. On arrival in Kathmandu we bring you back to your hotel. 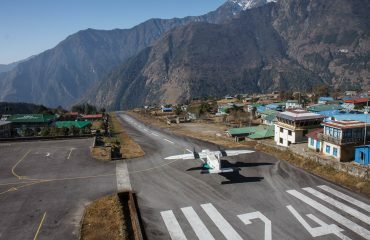 Lukla airport - "527 m long, 30 m wide, 11.7% gradient at elevation 2,845 m, from cliff to barrier." Thame monastery on rock. - "There is a lodge there, so you can buy refreshments or accommodate. Monks played cards there listening a bluetooth speaker playing from mobile." In Kathmandu, before and after your EBC trek, you will be staying at a 3-star hotel with a private bathroom and wifi. The hotel has a prime location, in the travellers neighbourhood Thamel. This are nearby many restaurants, trekking gear shops and supermarkets. 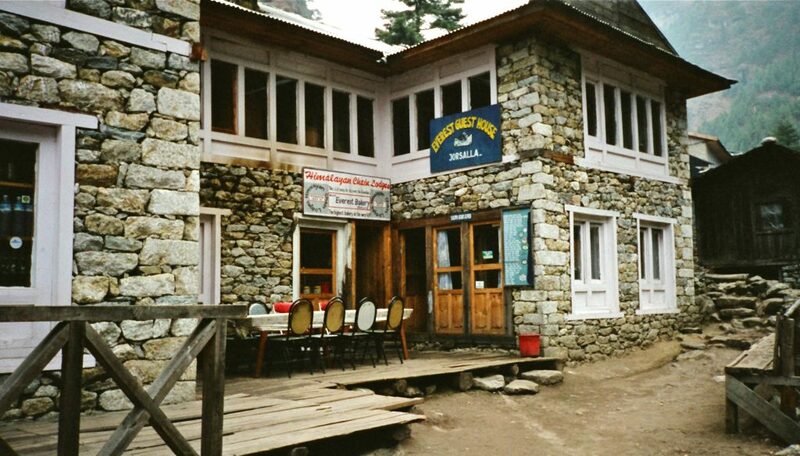 During your EBC trek, you will be staying at mountain lodges. North of Lukla, the lodges are broadly identical stone houses. They have small, double rooms and mostly shared bathrooms. Lukla airport by Petr M.
Dudh Khosi river by Lenny K.
Namche Bazaar by Stefanos N.
Kid in Namche Bazaar by Stefanos N.
Upper Dingboche by Sheikh I. 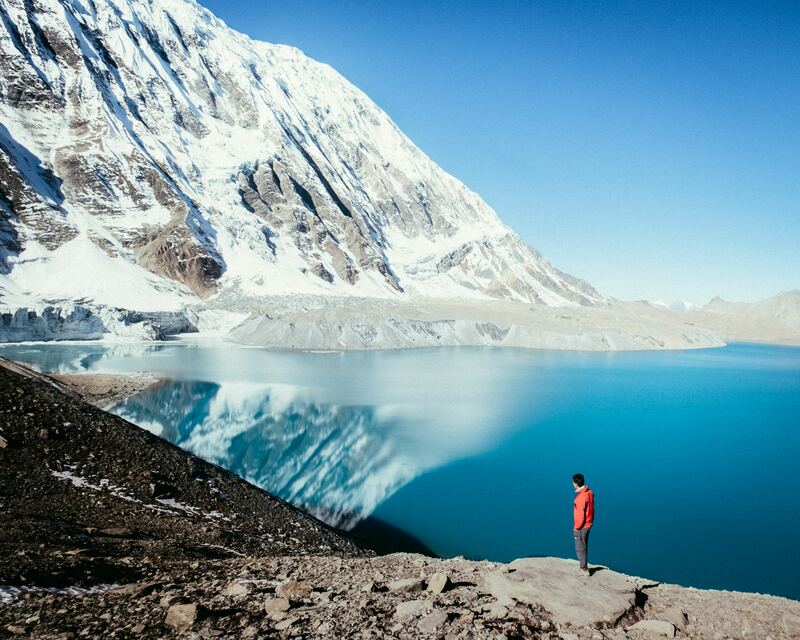 View from Dingboche by Stefanos N.
Gokyo Ri by Matthew L.
Ngozumpa Glacier by Savage McK. Thame monastery on rock. - There is a lodge there, so you can buy refreshments or accommodate. Monks played cards there listening a bluetooth speaker playing from mobile. by Petr M.